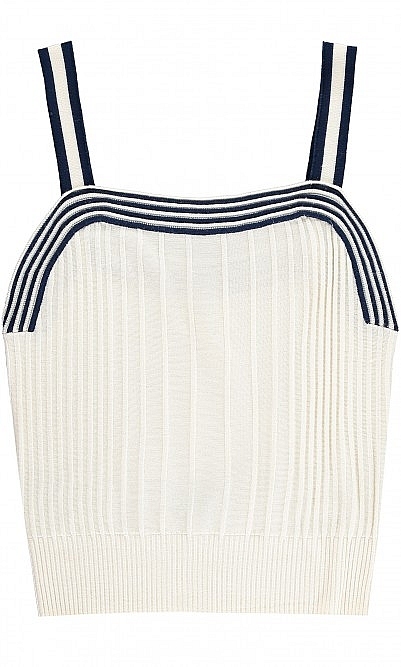 A contemporary rib knit top in ecru with nautical navy stripe trims and a curved neckline for a flattering fit. A versatile top for styling Summer outfits. Made from a sustainable high quality merino Summer wool. Made in Britain. Fabric and care: 100% Merino wool. Cool handwash. Expensive but totally worth it... It's a lovely classic /retro little strappy top which I will wear a lot. I doubt it will ever go out of fashion so I am happy to pay good money for good quality. The knit is tactile and covers / shapes beautifully.